X300 Style comes with 125 grain field points (not installed). Precision Matched for spine and grain weight. Custom Grade arrows of Premium Port Orford Cedar, 5/16” and 11/32” Diameter with either 4”or 5” selected barred feathers for hens and a dyed solid colored turkey feather for the nock feather. Special smooth finish. Shaft color: stained or natural with 10” colored Shaftment under the fletching, matching attractive crest and finely pin striped. Lengths from 27” to 31” BOP. 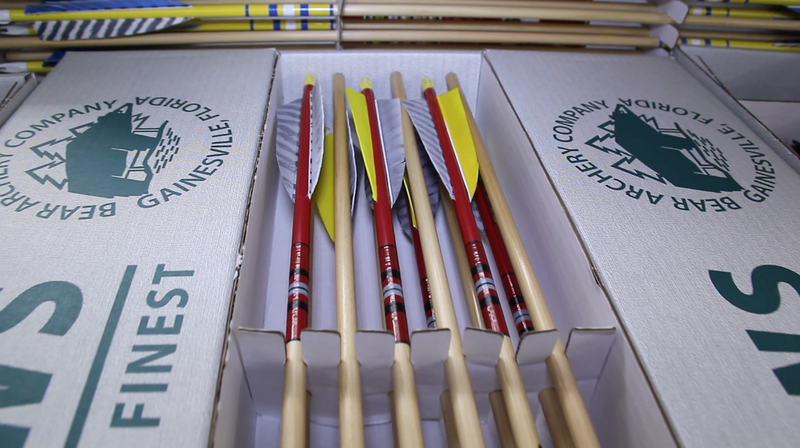 The Bear logo on the arrow will match in color (as close as possible) the Shaftment,feathers or cresting color. All feathers will be matched to cresting, nock or crown dip as closely as possible, nocks will be Bohning Classic. Yup, that’ll do it. You have my apnrociatiep.